The scientists awarded the Rossi Prize were Professor Douglas Finkbeiner of the Harvard-Smithsonian Center for Astrophysics (CfA), Professor Tracy Slatyer of the Massachusetts Institute of Technology (MIT) and Meng Su, a joint Einstein/Pappalardo fellow of physics at MIT and Kavli Institute for Astrophysics and Space Research. Fermi bubbles are gigantic structures extending from the galactic center and spanning about 50,000 light-years from top to bottom. Data from NASA's Fermi Gamma-ray Space Telescope revealed the bubbles, which may be the remnant of an eruption from a supersized black hole at the center of our galaxy. This surprising finding has stimulated additional observations at other wavelengths, as well as computer simulations to understand the bubbles' origins. The prize-winners' 2010 paper reporting the discovery has garnered more than 200 citations in only three years. 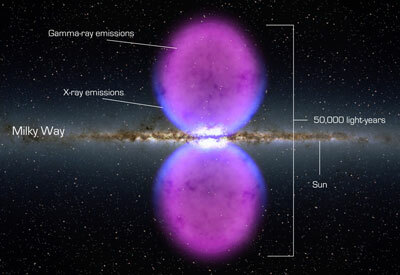 "The Fermi bubbles are a reminder that new data can hold fascinating and completely unexpected surprises,” said Slatyer. "This work has stimulated additional observations of the bubbles at other wavelengths, and computer simulations to understand their origins," said Finkbeiner. “Our discovery would not be possible without the dedication of many scientists and engineers working on the Fermi Gamma-ray Space Telescope,” said Su. The AAS High Energy Astrophysics Division (HEAD) awards the Rossi Prize in recognition of significant contributions as well as recent and original work in high-energy astrophysics. The prize is in honor of Professor Bruno Rossi, an authority on cosmic ray physics and a pioneer in the field of X-ray astronomy. The prize also includes an engraved certificate and a $1,500 award. The recipients will give a joint lecture at the 225th AAS meeting in Seattle, WA in January 2015.